Email has great importance in business and education and its impact on daily communication practices is undeniable and far-reaching. Every day, millions of emails are sent from companies to customers, employees to other employees and students to faculty. Northwest provides each member of its campus community, including its recognized organizations, with University email accounts via Office 365 (Outlook). 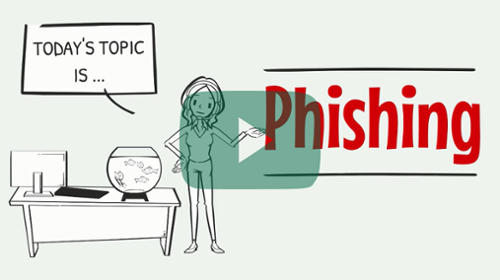 Phishing is a form of fraud or theft by deceit! 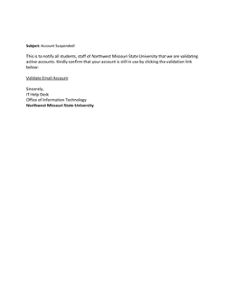 Similiar to a fisherman using a lure to catch a fish, the fraud takes the form of an individual or individuals pretending to be a legitimate company or person in an email, text message or other social media communication method in order to obtain your login credentials or sensitive account information. Typically a victim will receive a message that appears to be sent by a known contact or reputable organization with an attachment or link to click on. The attachment or link will typically install malware on the victim's device or direct the victim to a malicious web page to trick the victim into divulging their personal and/or financial information such as passwords, social security numbers and credit card details. To make phishing messages look like they are genuine, the sender will include logos and information taken from a legitimate institution's web site and even have a simliar (but different) email address. Be aware, don't take the lure and get hooked! How do I protect myself from becoming a victim? 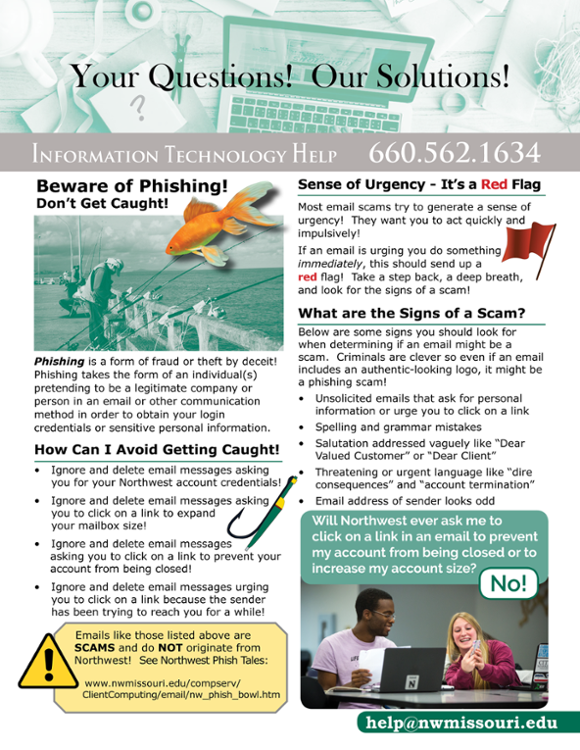 Don't email personal or financial information through email! Email is not a secure method of transmitting sensitive personal information! Never click on a link in an email unless you are absolutely sure the message is legitimate! In short, thoroughly invesitage the email message and see if there is an alternative way to get the information without clicking on the link in your email! Always be cautious about clicking on all links, opening any attachments or downloading files from emails regardless of who sent the email. They can contain viruses and malware! Look critically at the full email address not just the first few words to see if the email is a legitimate email address at the institution or company! If it is from a credit card company or bank that you are affiliated with, call the bank or credit card company or go directly to their web site to investigate the email. Only provide personal or financial information through an organization's official web site! Critically look at the organizaiton's web site address! Is it their legitimate "secure" address or is misdirecting you to a phony web site! If you accidentially do click on a link in your email and realize it was a mistake, immediately change all your passwords, check for Rules that may have been setup in Outlook to delete or misdirect your email. Delete suspicious emails and/or report them by forwarding the emails to appropriate IT security staff of the institution that provides you with your email, social media or phone service. 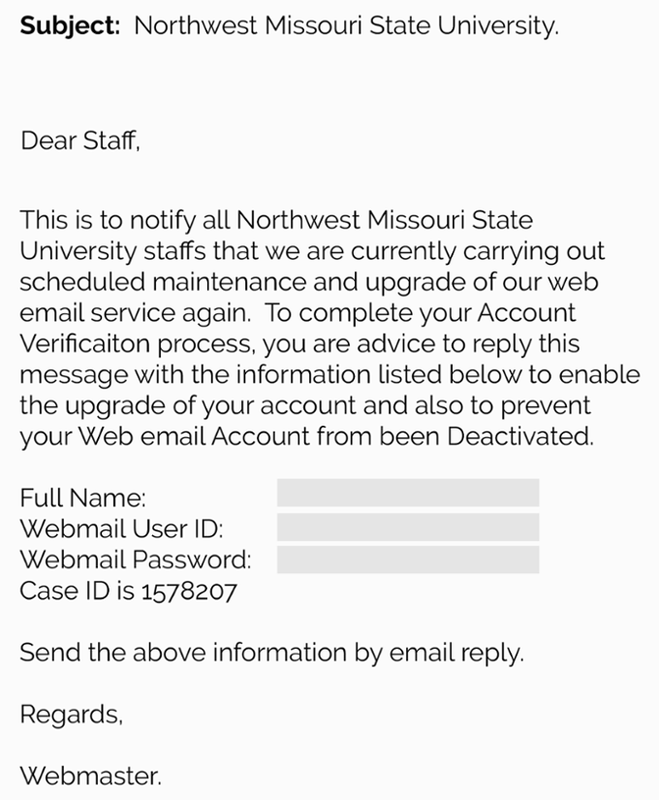 Below are just some examples of phishing schemes seen by Northwest email users. Please do not assume an email message is safe if it is not listed here! There are many variants of the following emails and new phishing emails are sent out each day! When in doubt, don't click! Instead consult with appropriate IT support staff!